!! OMG, She Has a Blog: Lourdes Ciccone !! 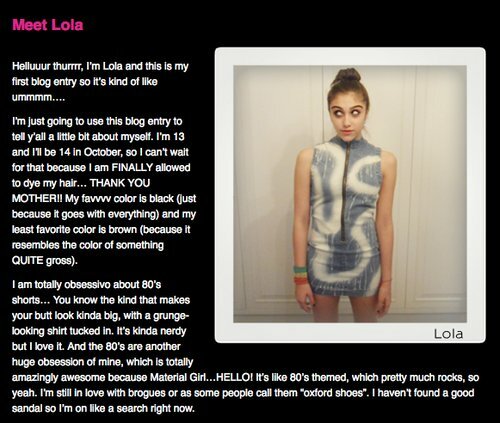 10 Comments on "OMG, She Has a Blog: Lourdes Ciccone"
Wow! So many negative and jealous comments! Madonna is absolutely the most beautiful and strongest women that I have ever seen. I have so much gratitude for her! Her daughter Lourdes is also beautiful and intelligent like Mama Madonna! I wish them the best! Well I just hope she doesn’t sleep her way to the top like her mom did. Every freakin’ thing Madonna ever did in her entire life was phony commercial garbage. Anyone who thinks that this giant hairy-browed rat is anything but an advertising tool for Madonna brand Inc. is probably one of those ignorant losers that bought into this phony commercial pop phenom. She is a disgrace and so are you. this is fake. its just some PR intern using this as a way to promote the material girl line. get real people! im sure that what she is wearing will 100% be in the new collection. Who really cares? She’s a much watered down version of Madonna, the only style she has is what she see’s in her mothers videos. What was considered style in the 80’s should really stay in the 80’s!!! Who does this little madam think she is? Here in the UK, I went up my first chimney at age 6 and now at the age of 10, I own the firm, employing hordes of pre-pubescent kids and keeping them off the streets. I’m telling you, there’s no need for black hair dye where my employees go (or slaves, as I like to call them). It makes me so angry when I read of these slackers who, just because they have celebrity parents, think they can wait until their teenage years before owning their own clothing line. It always gives me a little hope when I hear about celebrity parents setting boundaries for their children. I would not have expected a “no hair dye until 13” policy in the Ciccone household. Builds character to be denied those little crutches of self-expression at first.